Daniel Roth presents ENDURER, its brand-new model that represents a mini-revolution in the design of the brand’s collections, yet without betraying its family likeness to the emblematic shape of the cases that have forged its reputation. ENDURER lives up to its name and hides nothing of its strength of character, nor its determination to please. On a watchmaking scene where extravagance and extreme complexity are the name of the game, Daniel Roth responds by displaying its mastery of classic and sporting traditional watches addressed to a broad audience. While a first glimpse at the new Daniel Roth timepiece is enough to appreciate its virile nature, it is well worth taking a closer look at the details in order to perceive the origins of its creation. For while men are indeed at the heart of its vocation – it was definitely designed for the masculine wrist – its design draws its inspiration from another source. In the land of the rising sun, kendo is the oldest and most popular of the modern martial arts. The kendoka’s mask, covering the face, head, shoulders and torso, is fitted with a metal grid composed of 13 to 15 bars depending on its size. Like the discipline that inspired it, the powerful design of ENDURER admirably expresses a set of values such as tenacity, sturdiness, strength and endurance. And like the kendoka, who is distinguished by its blend of physical and mental strength, ENDURER has been built to last. The extremely pure display ensures extremely clear read-off of the information: the numerals are replaced by luminous markers separated by the minute circle and appearing to rest on a second circle hosting the large date display. Contrasting with the rest of the dial by its Arabic numerals, the Chrono spring function appears at 6 o’clock. While undeniably new, ENDURER nonetheless respects one of the essential and most visible features of the brand’s genetic heritage: the emblematic design of the double ellipse case. Generously sized at 41 x 44 mm and water resistant to 10 atm, it is made from steel with a black coating based on BlackTich titanium carbide, or from Marine Steel 4435 Staybrite – a special grade of steel boasting enhanced corrosion resistance. 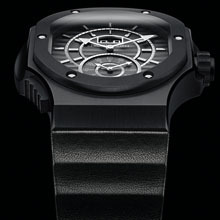 While distinctly larger and sportier, it nonetheless radiates an immediately appealing trait of character: gentleness. For example, the angles have been cut and polished to create a more luminous effect. Moreover, one need only admire the watch from the 6 o’clock side to discover a set of surprising curves: the concave bezel, adorned with six screws and fitted with a convex glass, adopts an equally concave shape at 3 and 9 o’clock – almost as if the case bore the thumbprint of the master-watchmaker who fashioned it. The Chrono sprint function push-button located between 7 and 8 o’clock features a ridged design ensuring a firmer grip and entirely in harmony with the dial and strap. The finishing touches are on a par with this overall aura of quality, since the two watch glasses are glareproofed on both sides. The crown is stamped with the three-arm logo evoking the brand’s iconic seconds hand. 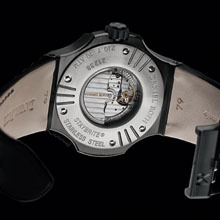 The exclusive self-winding DR 1306 movement beats to the cadence of 28,800 vibrations per hour. It displays the hours and minutes on a slightly off-centred axis, and the large date through a window at 12 o’clock. Based on a patented mechanism, the latter boasts a dedicated design significantly larger than its competitors. The offset position of the hour and minute functions gives pride of place to the Chrono sprint function at 6 o’clock. A rarity in the field of fine watchmaking, this “simple” but useful complication consists in a simplified chronograph mechanism serving to measure long periods of time. It does this by indicating hours and minutes by means of two hands mounted on a single axis. 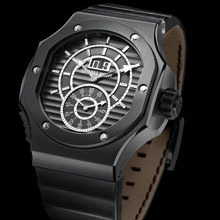 A single press on the pushbutton at 7.30 positions the hand at 12 o’clock and starts the chronograph. Another unusual detail relates to the fact that the virile appeal of this watch also stems from the design of its wristband, featuring three ridges lending an extremely original touch to the overall design. But here again, this masculinity is not exempt from a certain softness, since this wave motif is discreetly reminiscent of the traces left by a rake on the sand of a Japanese dry garden… or by the fingers of the watchmaking artisan. Available in calfskin and equipped with a pin buckle bearing the Daniel Roth logo, the strap is stitched with tone-on-tone seams. ENDURER, the “second” Daniel Roth, radiates a more masculine and sporting appearance than the brand’s other models. The power of its design lies in a subtle blend of strength and gentleness, combining respect for an established DNA with an exploration of other design codes. Inspired by and shaped like a kendoka’s protective mask, ENDURER immediately catches the gaze with the horizontal lines adorning the dial and extending onto the strap. In addition to its patented large date indication, the dial displays a “useful complication” designed to measure long periods of time: the Chrono sprint. One can safely bet that ENDURER will make a lasting impression on enthusiasts of fine watches endowed with distinctive character.